DURING WINTER TIME ALL AFTERNOON ACTIVITIES DEPART AT 15H00! Enjoy our full day tour in the majestic Concession Area of the Palmwag Lodge. 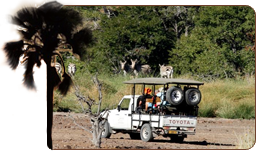 Your open game viewer vehicle departs early morning at 07h00 from the lodge reception. Your experienced guide will discover with you the endless beauty and wide spaces of the Palmwag Concession. Apart from the stunning landscape, the Damaraland Wildlife Experience offers free roaming game species such as Mountain Zebra, Giraffe, Kudu, Oryx, Springbok, Ostrich, Jackal, Brown and Spotted Hyena, as well as the desert adapted Elephant, the endangered Black Rhino and Lion. The excursion will take you far away, off the beaten tracks where you will get the feeling of peace and tranquility. Around lunch time your guide will set up a bush picnic for you when hunger is calling. The tour arrives back at the lodge at 15h00 in the afternoon, in time for you to enjoy the rest of the day at leisure and make use of the wonderful facilities the lodge has to offer. Included: Guide & vehicle, beverages and light lunch. Take a walk on the wild side with one of our guides and discover the smaller wildlife that our stunning Concession has to offer. Your professional guide will show you the different tracks of the animals which live in the Concession Area and the wonderful and interesting plant life that survives in this arid landscape. Our morning drive takes you into the Palmwag Concession for 4 hours to discover and search for the wildlife that roams in this arid paradise. Your experienced guide will show you all that the Palmwag Concession has to offer, from a majestic landscape to our free roaming wildlife such as Mountain Zebra, Giraffe, Kudu, Oryx, Springbok, Ostrich, Jackal Brown and Spotted Hyena, and with a bit of luck and skill, the desert adapted Elephant, the endangered Black Rhino and Lions. Children of all ages are permitted to participate on this wonderful experience. Included: Guide & vehicle & beverages. Our afternoon drive takes you into the Palmwag Concession for 4 hours to discover the wildlife that roams in this arid paradise. Your experienced guide will show you all that the Palmwag Concession has to offer. During your drive you can also see the free roaming wildlife such as Zebra, Giraffe, Kudu, Oryx, Springbok, Ostrich, Jackal, Brown and Spotted Hyena, and with a bit of luck you may spot the endangered Black Rhino and desert adapted Elephant and Lions. The afternoon drives provide a fantastic light that falls over this beautiful land. It’s a photographer’s dream. You will visit some of the natural springs that provide fresh water for the animals who have been roaming the whole day in high temperatures in search of food. Just before sunset, your Guide will take you to a view point for a once in a lifetime sundowner, setup with refreshments and a snack platter to enjoy with the breathtaking scenery. Children of all ages are permitted to participate on this wonderful experience. The Under Canvas sleep out is a true Namibian adventure that lets you experience the raw nature of the Palmwag Concession. Your experienced guide will show you all that the Palmwag Concession has to offer. On your drive you can also see the free roaming wildlife such as Zebra, Giraffe, Kudu, Oryx, Springbok, Ostrich, Jackal, Brown and Spotted Hyena with a bit of luck you can spot the endangered Black Rhino and desert adapted Elephant that call this vast landscape home. The Tour will take you far away off the beaten Tourist tracks and give you a feeling of peace and tranquillity. The experience you get from sitting around the fire at night in this vast landscape and the sounds of nature that travel through the crisp night air is unbeatable. Your guide will meet you at 15h30 at the main reception at Palmwag Lodge where you will depart on an afternoon Game Drive and a Sundowner stop before you head to your camp that has been set up for you. After you have settled in, your guide will prepare a true Namibian Braai (BBQ) under the stars of Namibia. The following morning your guide will take you on a small walk from the camp, on your return your guide will set up breakfast after which you will depart on a morning drive that takes you back to the lodge. min. 2 persons / max. 8 persons. Palmwag Lodge in a joint venture with the Torra Conservancy, Anabeb Conservancy and Sesfontein Conservancy and offers rhino tracking in the Torra Conservancy. The communities / Conservancies directly benefit from these excursions since part of the income generated through rhino tracking is paid to the Conservancies. This excursion is done with our open game drive vehicle to the location and the tracking is done on foot in search of Rhinos. 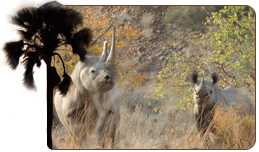 During this excursion your experienced guide accompanied by an experienced tracker(s) takes you off the beaten track into the vast areas of Damaraland to track and observe the endangered Black Rhino. The excursion departs at 06h30 from the main reception at the lodge. While this excursion’s main focus is on tracking rhino, you might spot other wildlife species such as Mountain Zebra, Giraffe, Kudu, Oryx, Springbok and many more. It is essential that you as guest attend the rhino tracking briefing at 18h00 at the main restaurant the evening before. Your guide and tracker will inform you about various important safety and behaviour issues regarding the tracking. No Children under the age of 12 years are permitted on this excursion. Tour Operators are requested to book these excursions well in advance. The following information should accompany each booking and the terms and conditions here under apply. Please note that terms and conditions may be altered without prior notice. Names and passport numbers of clients. Country of origin of clients. Minimum 2 persons, maximum 8 persons per vehicle. Indemnity forms to be completed at the lodge before excursion departs. Proper hiking shoes / boots. 06h00 – Breakfast – Not applicable to Campers unless pre-booked and fully paid!